Hello. You have reached the blog of Kristina. I’m out of the office until Monday, August 13th. If you’d like to leave your name and a comment, I’ll get back to you next week. At the tone, please enjoy my view as I drink my morning coffee. Aloha! 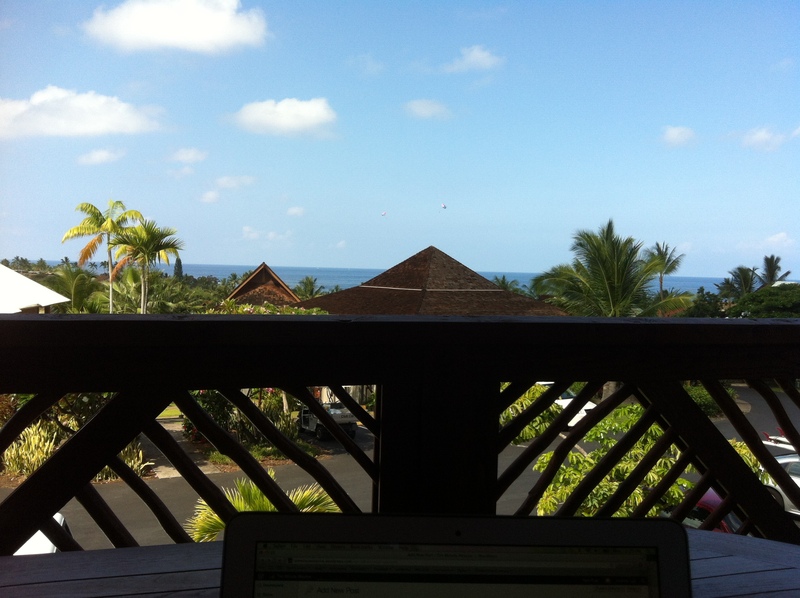 This entry was posted in Front Page and tagged Kona Hawaii, OOTO, out of the office, vacation by kristina. Bookmark the permalink. I like how the railing and the pyramid shaped roof are almost symmetrical and then everything gets progressively more the opposite of symmetrical with distance. Why, it’s almost as if it were an analogy for a life (of course it could be aaaaanyone’s life) wherein one may exert much control over that nearest the observer, no control At All for anything farther away and yet, and yet it looks like, why yes! It all works just fine in end composition of this lovely moment you’ve presented. Damned clever of you to slip in another of your great analogies: the “Life is like this picture, so take a moment and ease up, ya control freaks!) analogy. You are STILL the reigning Queen of the Analogy! I’m jealous!May I join you?